I’d known for some time that I had eyes sensitive to light. No need to be more specific, right? Wrong! It does help to know the underlying cause of eye sensitivity to light to fight it. What got me intrigued about blue light was an accident with Christmas tree lights. Until a couple of years ago we’d only used red lights. Then we decided to use blue ones. As far as my light sensitive eyes go it was a terrible mistake. Blue glare immediately felt uncomfortable to my eyes and my head. I couldn’t stand having the lights within my filed of vision. It was even worse in the dark (only with blue lights on). My eyes were fatigued no matter where I looked although the blue glow was relatively weak. That’s strange, I thought, because previously I’d had no problems with the old, red lights. So I decided to change them and… Voila! I could stare directly into the red lights, in the dark!, and felt no eye fatigue whatsoever. That made me curious: are my light sensitive eyes in reality sensitive just to blue light? Very briefly, this is what you can find in scientific reports. It is not that clear-cut and simple, but to a large degree it is true: For most of us eye sensitivity to light (light and glare induced visual discomfort and pain) tends to be principally (not exclusively) due to blue light. More specifically, eyes sensitive to light tend to have deficient macular pigment which is our natural, internal blue light filter. Disclosure: I would like you to know that I earn a commission – at no additional cost to you – if you use some of the links below and purchase a product. If you wish to support GLARminY, use the links containing text: Disclosure: commission link. You may also “donate” to GLARminY a small percentage of anything you might buy from Amazon by accessing Amazon through this link (Disclosure: commission link) at any other time. Thanks for your help! Cooler, more bluish, light (~5500-6500K when compared to warmer light ~2700-3500K) tends to be more uncomfortable causing eye fatigue and other eye strain symptoms. The severity of symptoms constitutes a continuum, such that some people are affected much more than others. It’s been estimated that 5-12% of the population suffers from visual stress that, in many -but not all- cases may be releived by reducing the amount of blue light (Levels of visual stress in proficient readers: Effects of spectral filtering of fluorescent lighting on reading discomfort; 2015. Spectral filtering of fluorescent lighting: Effects upon reading and visual discomfort in slow readers; 2012). 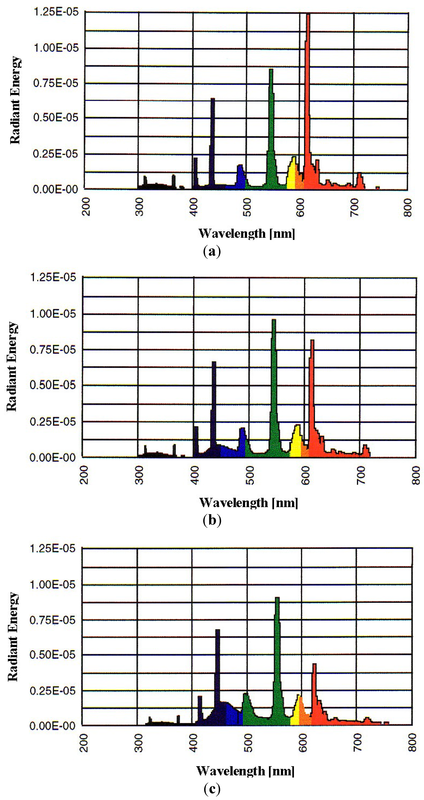 Spectral Distribution of Fluorescent Lamps (source). As light is cooler, bluer – its Correlated Color Temperature (CCT) increases from: (a) 3,000 K; (b) 4,000 K; (c) 6,500 K, the energy emitted by a fluorescent light source shifts from longer wavelengths (red) to shorter wavelengths (blue part of the spectrum). Spectral power distribution of LED lamps (source). As LED lamp emits cooler, more bluish light – High Correlated Color Temperature (CCT), most of the energy emitted shifts towards the blue region, i.e. below ~500nm. The TOO BRIGHT!! signal is transmitted to our brain via a special type of neurons found in eye’s retina (intrinsically photosensitive Retinal Ganglion Cells – ipRGCs) that are light sensitive themselves, particularly in the blue range, peak at ~480nm (ipRGCs are the primary but not exclusive circuit for light aversion; 2012). Normalized spectral sensitivity curve of human ipRGCs. Adapted from (On Seeing Yellow: The Case for, and Against, Short-Wavelength Light–Absorbing Intraocular Lenses; 2012). One of the functions of Macular Pigment is to block blue light (see below). 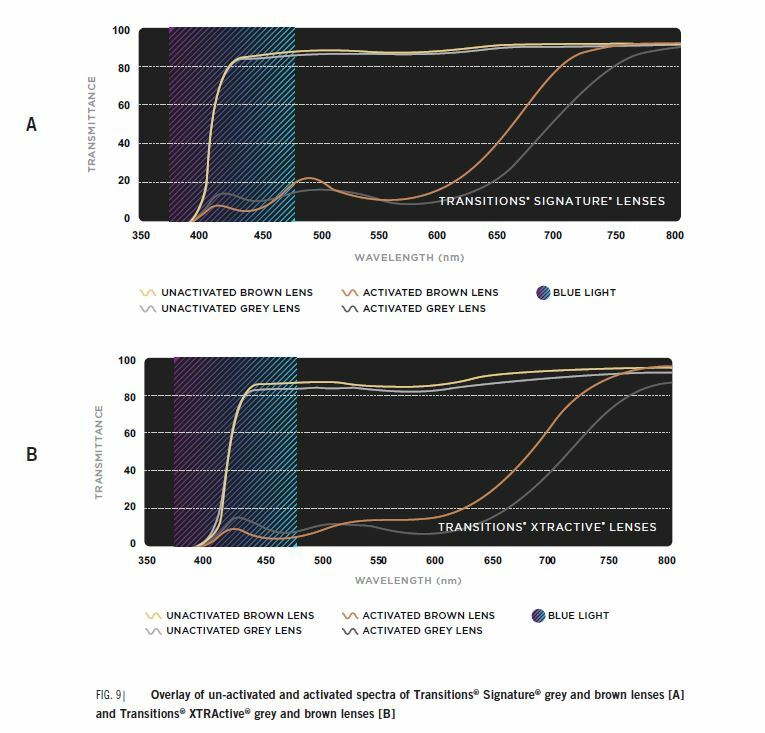 It’s light absorption is the highest near ~460nm and drops to zero by ~530nm (The Visual Effects of Intraocular Colored Filters; 2012). Macular pigment absorbs blue light considerably more than other visible light wavelengths – peak ~460nm (Macular pigment densities derived from central and peripheral spectral sensitivity differences; 1998). Eyes with low MPOD (macular pigment optical density), i.e. macular pigment’s poor blue light filtering capacity – are more sensitive to light. Hence, low MPOD means lower threshold to light induced pain (Action spectrum for photophobia; 2003. Macular pigment optical density and photophobia light threshold; 2006). In some people macular pigment can filter as much as 10 times less blue light than in others (Individual variations in the spatial profile of human macular pigment; 1997) and it tends to decline with age (Resonance Raman Measurement of Macular Carotenoids in Normal Subjects and in Age-related Macular Degeneration Patients; 2002) … see images below. 3-D representations of different MPOD profiles – blue light absorption levels (source). MPOD blue light absorption capacity tends to decline with age (Resonance Raman Measurement of Macular Carotenoids in Normal Subjects and in Age-related Macular Degeneration Patients; 2002). To summarize, scientists have approached the issue of eyes sensitive to light from different fields. They appear to be converging on the theory that eye sensitivity to light is primarily a matter of blue light sensitivity which depends on the capacity of each person’s macular pigment to filter blue light. Before suggesting some solutions let’s take a look at a simple way to check if and how sensitive to blue light your eyes are. There is an easy and free test of eye sensitivity to blue light. Download and install f.lux blue light filter app. F.lux allows you to increase and reduce the intensity of blue light emitted by your screen (see images below) with minimal detriment to contrast. (a) high blue peak: 6500K setting – f.lux filter OFF, (b) reduced blue peak: 2700K setting (70-80% of blue light filtered), and (c) minimal blue peak: 1200K setting (94-98% blue light filtered). If you use f.lux default settings your “white” background will look like it does in the image (a) during the day and look closer to image (b) at the beginning/end of the day and at night. This is because f.lux app was designed to address the problem of sleep disorder and not to solve the eye sensitivity to light problem. (Click on images to see more detail). (1) Set f.lux to a lower lighting setting, e.g. 2700K (see red arrow in the image below). At 2700K setting blue light emissions are reduced by about 70-80%). For this window to appear click on the f.lux icon on your task bar. Note that, as you move the slider the number at the lower right extreme of the slider changes. It indicates the correlated color temperature of the screen in Kelvin (K) – the lower this number the less blue light is emitted by your screen. Since you are in the Custom Colors mode (see drop-down menu in the upper right corner of the f.lux window) the blue light reduction should remain constant independently of the time of day. If you feel immediate relief from eye strain in your eyes, than blue light is most likely the cause (or one of the causes) of your sensitivity to light. (2) If after carrying out (1) you don’t feel an immediate improvement in your eyes, try working with f.lux running with the same settings as in (1). After a day or two check how it feels if you disable f.lux. If you find the change (more vivid, cooler and bluish colors) disturbing, more uncomfortable, your eye sensitivity to light is likely induced by blue light. However, your eyes are probably less blue light sensitive than if you feel much better immediately after (1). There are several ways of temporarily disabling f.lux. The quickest is to press Alt-End. (By pressing it one more time you enable f.lux again). You can also click on the menu icon (upper left corner of the window), select Disable and click/check for an hour or until sunrise. (Repeat the same action to enable f.lux). (3) If you felt uncomfortable or annoyed by the yellowish look of your screen with f.lux running, or if you haven’t noticed any difference in your visual comfort after (1) and (2), than the cause of your light sensitivity may be other than blue light. You may continue your search for your perfect (least eye straining) color here. You might also consider intuitive colorimetry or irlen.com to determine what specific tint would make your eyes feel better. To figure out the level of your eye sensitivity to blue light try adjusting the lighting settings in f.lux (red arrow in the image above). The more you need to reduce screen’s blue light emissions (move f.lux lighting setting sliders left) to feel comfortable, the more sensitive you are. Another alternative is to get our blue light filter tester with 8 interchangeable filters of different blue blocking characteristics. It’s advantage is that it will give you better information about what spectral transmission makes you more comfortable. Moreover, it works not only with computer screen emitted blue light, but also with all other light sources such as the sun, LEDs, and fluorescent lights. Once you’ve pinpointed the root cause of your eye sensitivity to light it is easier to find solutions. Macular pigment optical density can be improved in most cases through diet. This may be by far the best solution. Read more about it in this post. If you prefer taking macular pigment supplements to eating lots of green leafy vegetables you may buy them on Amazon (disclosure: commission link). Not all sunglasses lens colors are equally effective in filtering blue light outdoors. You can find more on this in this post. Wraparound eyewear recommended in the this post will be effective if you happen to spend considerable amount of time under cool, bluish fluorescent and LED lamps. See also the post addressing blue light in fluorescent (and LED) lighting. See 13 Blue light screen filters: Specs and recommendations. Check also this list of 10 different blue light filters to combat computer eye strain. Ps: If you found the post Are your eyes sensitive to light … or just blue light!? useful, please consider LIKING, REBLOGGING, and/or SHARING it below. I find that certain LCD screens hurt my eyes, and certain LCD screens don’t. Perhaps they are of cheaper quality, or perhaps they don’t emit as much blue light? I just bought a Dell P2417H monitor and they hurt my eyes! However, by significantly turning down the color levels through f.lux, it gets a little better. However with some LCD screens, I don’t even need f.lux to have it hurt my eyes. I wonder why this is the case? Asdf Fdsa, hi and thanks for this great comment! Many other people also have this same complaint. Monitors vary in many aspects. Unfortunately those that have a lot to do with computer eye strain are not easily spotted unless you get a chance to “test drive” them for a few days (a few minutes at the store may or may not be enough). In addition to relative blue light intensity you mention, there are other aspects that create eye discomfort: flicker and brightness control through PWM, font rendering, … (see here for more on this). The differences tend to be small, but as your experience and that of other people shows, small differences may be enough (here is a link to a post that looks at such small differences of different models of iPhones) – should be available in a week or so. The trouble is that many more people are not that sensitive to these differences (probably between 80-90% of the people) and so screen manufacturers have no real incentive to put an effort in making monitors more eye-friendly. Not yet. Moreover, another important variable (probably not your case) is that our eyes (visual system, to be precise) may get more and more sensitive to computer screen light based on more or less intense (ab)use and some predisposing factors. Sadly that is the experience of many of us :(. And once our brain has had enough, screens that didn’t used to bother us, start to cause as pain. (This may possibly have to do with the phenomenon called central sensitization (where pain itself can change how pain works, resulting in more pain with less provocation – and could lead to chronic computer eye strain. Important: This is just my hypothesis as I haven’t found any research specifically linking central sensitization and computer eye strain / computer light sensitivity). –sorry for this digression it is in case it might help anyone out there as it has to one visitor who suggested me to look into it. Yes, I second that idea of central sensitization! I am experiencing it at the moment. I used to own a Toshiba Satelittle laptop (a Truebrite LED screen), and it didn’t really bother me, until it died and I had to change it. I replaced it with an Asus Vivobook 17″. That new screen just hurt my eyes so badly! It was so bad that I even thought at first that my previous screen (Toshiba) must have been some other technology. But now I am sensitive to much less harmful LED screen. I have just obtained a BenQ GW2270 monitor, which is supposed to be an Eyecare technology. I must inform you that they have not done any miracle, unfortunately. The flicker is not there, which in itself is a good thing, but the blue light from the LEDs is unmistakably felt. After 1 hour it created severe strain in my neck and the upper part of my back. I am going to send it back and exchange it for blue-light blocking clip-on glasses! I must say thank you for your very well put together website. It has helped me through this new experience with blue light. Not everyone is clear on the subject; unfortunately companies will often say what is most likely to win customers, rather than state truths which may otherwise not lead to a purchase. At first I thought I would not need to follow the most stringent advices found among your articles, but I find that I have now become too sensitive to be like I was before. I had purchase a Fiara filter, which was not strong enough, possibly because the Asus laptop screen also had a bad Pulse Width Modulation. Then I also got Reticare filters for my phone and tablet, but I find now that even with this I cannot stare at them too long. So I now realise that I seriously want to use anti-blue light glasses to save my eyes and also to retrieve a normal sleep. By the way, I have recently got a Dell 2009WT monitor (CCFL backlighting!) It took me some getting used to the old CCFL backlighting technology again. But now I find that this is the best bet for any person for has become increasingly sensitive to blue light. I will certainly be working on my light bulbs at home in the next step! My dear hope is too know what true sleep is again. Again, thank you so much for your valuable directions. I have been severely light sensitive to white light since replacing my old trasitions glasses two years ago. I suspect in retrospect that the old lenses had gone slightly yellow, but I don’t have them – the optician didn’t return them to me. Could it be blue light that is causing the constant glare? Unfortunately I don’t know whether transitions could turn yellow with time. They certainly do block blue light in activated mode as shown by the spectrograms below. Brown tint is more effective at filtering blue light because it has more yellow in it (for more info see this article). So, it could certainly be that blue light is causing what you perceive as glare. We show stronger aversion to blue light than to longer wavelength light. The easiest way for you to find out is to get a pair of blue blockers (the UVEX ones cost about $10). I’m sensitive to blue light. Pigmentation deficit has been long documented, just never made the connection to the sensitivity, or was never told I would be! Since I work on computers with multiple monitors usually upwards to 4, I have major eye strain and headaches almost, my simple solution was to custom preset each monitor removing Blue! Luckily color accuracy is not something my job is concerned with. Javier, that is definitely a good option to reduce blue light to the bare minimum your screens are capable of. Thank for pointing it out! (Judging from your comment I suppose you probably already know what I am about to write, but I’ll do it anyway in case it benefits other visitors in the future). Most screens will emit some blue light no matter what software manipulation you carry out. For example, when displaying colors that in theory shouldn’t contain any blue light (such as black -rgb:0,0,0, or red -rgb:255,0,0). The easiest way to see this is to set your screen to display black only and make the room dark (it is simple at night, just turn off the lights). You’ll see a blue glow comming out of your screen. But careful, always pay attention to the spectrograms of blue light filters you are considering. Get a filter that eliminates all blue light up to about 500nm (for eye strain), 550nm (insomnia). And don’t fall for sales tricks like: “100% bad blue light blocking and no color distortion”, i.e. a clear looking filter. Remember that you can’t block blue light and see it too! This is such a fantastic site. Thanks so much for all this information.